Garfield is a comic strip created by Jim Davis. Published since June 19, 1978, it chronicles the life of the title character, the cat Garfield (named after Davis's grandfather); his owner, Jon Arbuckle; and Arbuckle's dog, Odie. As of 2007, it was syndicated in roughly 2,580 newspapers and journals, and held the Guinness World Record for being the world's most widely syndicated comic strip. 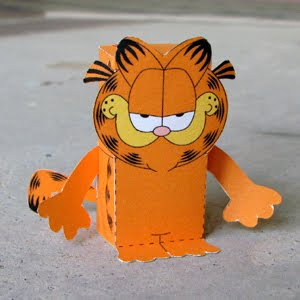 Download the PDF file here and make your own Garfield toy. What great toys! I haven't come across any like these before, I think my daughter would appreciate the Tinky Winky Toy at the bottom of the page.